Three-light chandelier from Gather possesses a smart simplicity to complement today's home. Antique Bronze metal arms descend downwards and curve sharply to prop white etched glass shades. Etched glass add distinction and provide pleasing illumination to your room. Coordinating fixtures from this collection let you decorate an entire home with confidence and style. Gleeful simplicity defines this three-light chandelier from the Joy Collection. Refreshing and fashionable arcing forms of Antique Bronze metal arms enhance the etched white fluted glass. Coordinating fixtures from this collection let you decorate an entire home with confidence and style. Unique stem-hung construction carries the clean line all the way to the ceiling and, for sloped ceilings, six feet of 9 gauge chain is provided to allow the fixture to hang straight and level. 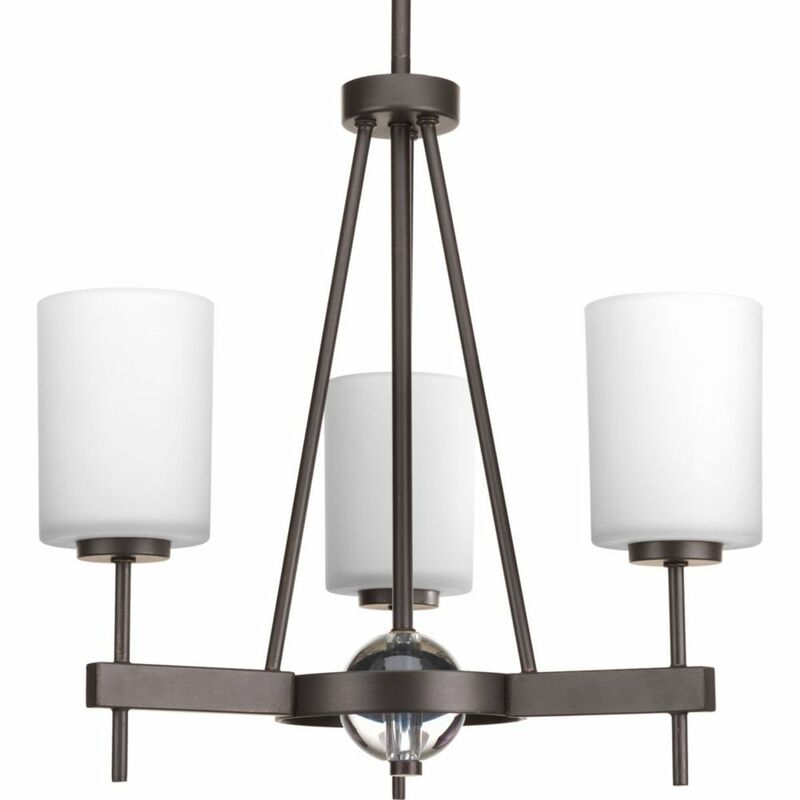 Compass Collection 3-Light Antique Bronze Chandelier Find your frame of reference with the Compass collection. Distinguished by crisp, linear elements that both contrast and cradle opal glass shades for pleasing illumination. Whether your style is modern or you simply prefer a style that is elegantly simple, Compass provides a sophisticated accent to your home's decor.